Like footprints in the snow, reading the signs and clues given to you before you even launch your boat, can spell success or lack of on any given day or body of water. You get to the launch on a sunny, no wind day. You look to the West and Black angry clouds with lightening bolts coming out of them are crowding the blue expanses and coming your way. Are you going to launch and head out 5 miles into the lake like you were planning, or let common sense tell you to wait or turn around and go home? From experience, you know what is going to happen weather wise and it isn’t good, so you cancel. The signs were clear; no matter what the skies above you were doing at the time it was going to be ruff, wet and miserable. 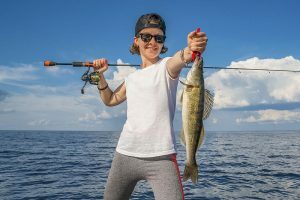 Likewise, reading the cues and signs given off by a variety of natural variables now and throughout the day, will give you insight as to what the fish catching strategies for the day should be. This improves your chances for success, and it is only a matter of reading what Mother Nature is showing you at the ramp. And after that, reading both what the fish and your equipment show you on the water. What am I talking about? Read on and find out. You get to the boat launch at your favorite walleye river. You see the river is above its normal levels and has a faster flow rate. 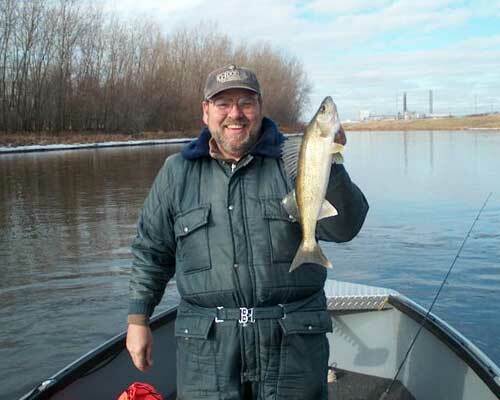 So before you even get out and look at the clarity of the water, you know that the walleye will have a little more comfort space than normal to roam around in. Especially since it is also an overcast day, and those secondary holes which are usually too shallow, might hold some fish today. 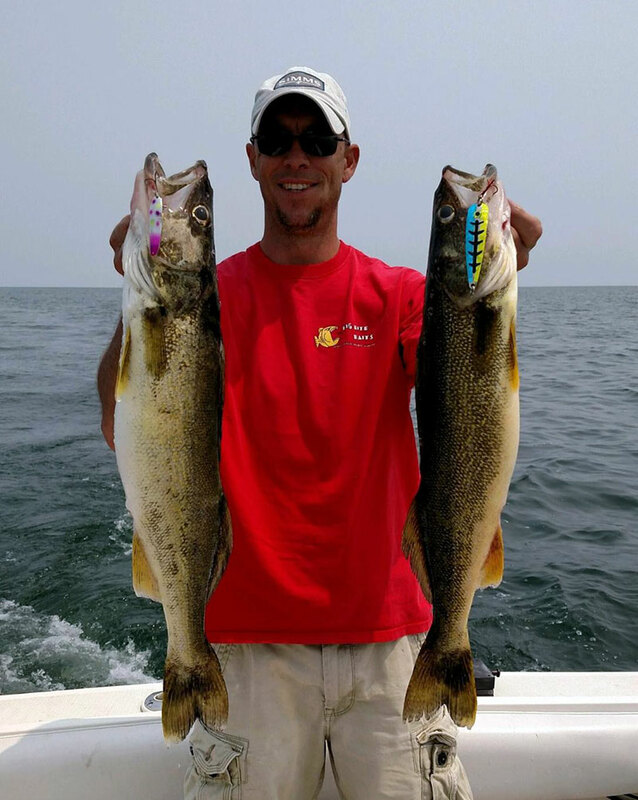 Plus, the holes you always successfully fish during low water might have too much flow today and push the fish out into those protected fringe areas, especially during and because of the cold fall and winter seasons. Hopefully, the water came up because the Dam upstream was opened to generate power and not because of heavy runoff from recent rains upriver. So you get out and take a look at the river waters clarity. It seems pretty stained, unlike its usual clear condition. (I’ve actually turned around and went home after finding the river in the same state as flowing mud. Your spitting into the wind thinking you’ll have a very successful day in those conditions). So it’s stained, now what? Get one of your rods out of the boat. The one with the chartreuse or Orange jig on it. Drop the jig into the water. How far down is the jig visible to your eye? 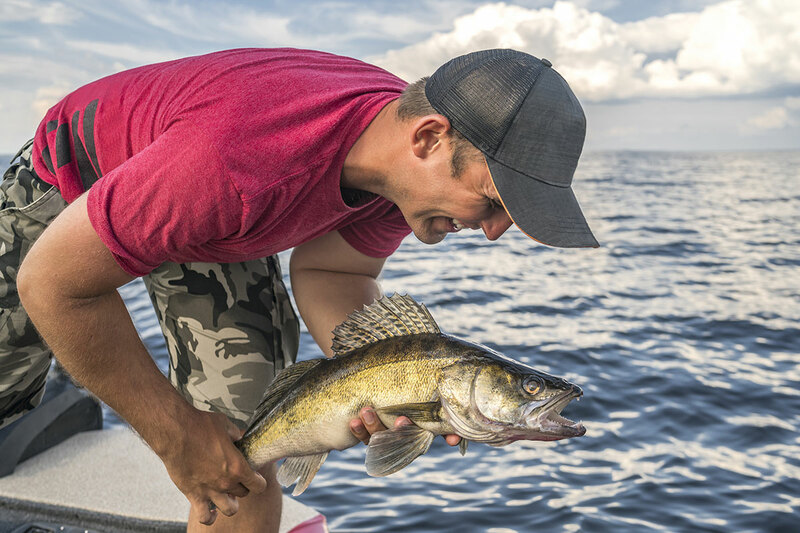 Walleye see 9 times better than humans in their underwater environment. So, you can see the jig almost a foot under water? That’s great, that means the walleye can see it 9 feet away. Add to that the other senses that walleye use when foraging, and things are really looking up. Is it windy out? A heavy wind can dictate both where you’ll be able to fish efficiently and possibly the technique you’ll have to employ. If you and the crew are not rigged for this possibility, it may be time to change or adjust your game plan now before you hit the water. You finally launch, and your fish finder temp gauge says the water temp is a frigid 34 degree’s. Trolling or casting crank baits has just been shoved onto the extreme back burner for today. Cold blooded animal like fish, stay pretty slow and lethargic in these cold water conditions. 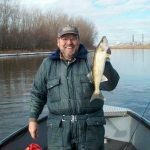 Reading the signs and locating walleyes in the open expanses of a big lake or reservoir is a lot tougher than in a narrow river. I guess my first question or observation would be what time of the year it is. Is it Spring Summer or Fall? 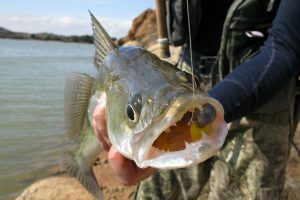 Spring fish will be located near or along the shorelines near the rivers, reefs, sunken islands or weedy areas, recovering and foraging after their spawning ordeal. Bigger baits or cranks will work best at this time, because there are no young of the year in the system as of yet. Summer fish will be dispersed and located throughout the whole system and water column. The usual holding areas where forage cover and close deep water sanctuaries are nearby. Often featureless, flat areas hold many foraging walleyes. The abundant schools of baitfish roaming these areas keep the walleyes interested and zeroed in on that area. Fall fish tend to gravitate back close to shore and continually nearer their spawning areas. Bigger cranks will again get their attention as the young of the year have now grown up some. Many of the smaller males will start their runs up any rivers that may run into the main body of the big water. I guess more of the obvious signs to mention would include local bait shops around the water you plan to fish. Mosey on into the tackle shop, take your time and look and listen to the locals coming in. Ask about the local favorite lures and techniques. Ask if they have any Lake Maps with the better fishing areas marked on it. Be friendly to the owners or people working for them. They can do more to help you out then anybody else. Well, you finally launch your boat. Your arsenal today includes crank baits and crawlers. You’ll be using both mast and inline planner boards for your technique presentation. Now what signs are we looking for? As you clear the channel you see a bunch of boats working a reef a few miles off shore. 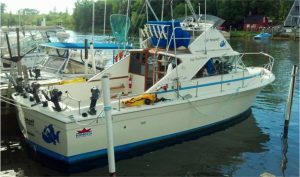 You head over and set the mast boards out. One side is running shallow and the other deep. You see a few boats around you netting fish, but your rods have not had a touch. What’s going on? Are you listening to what your planner boards are telling you? No, I didn’t drink to much Bay water. Read the signs and do a little zig zagging. If I make a turn and the outside board gets a fish, I speed up. If the inside board get a fish, I slow down. If another boats wake hits the boards and they stall, and get a fish when they start back up, I start stalling and engaging the motor. This may imitate the darting, fleeing action of baitfish on days when the water is calm. 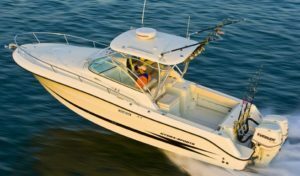 If all your lines are set at the same length using the same lures and the first line out from the boat gets the hit, your others are set to long. That’s because the first rods line out from the boat, is out of the water more than the others. And the height and angle from the top of the mast to the board makes the crank bait run shallower. This doesn’t happen using the inline boards, as the in lines sit on top and always run parallel with the water. Conversely, if the outside rod gets more hits, lengthen the leads on the inside lines. Of course reading, calculating and applying all the signs that your other equipment is telling you can all help as well. 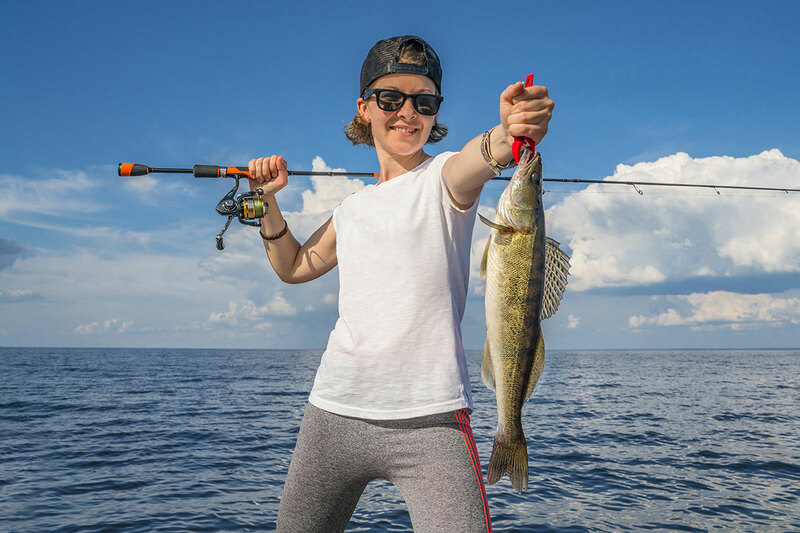 The speed, depth, temp and fish markings and where they are in the water column, all tell you both the mood and location of the foraging walleye. Lastly, charter boat captains make a living reading both the subtle signs and the ones that slap you in the face with their facts. Taking a first trip to any location with them will bring a lot of these hidden signs to light for you. Or if you prefer, just sit back, relax and let the captain worry about it. If on your own, heed, observe and obey all these signs. Because like the signs we humans all see daily on our roads and highways, they are both helping you and telling you the laws to be observed.